1. 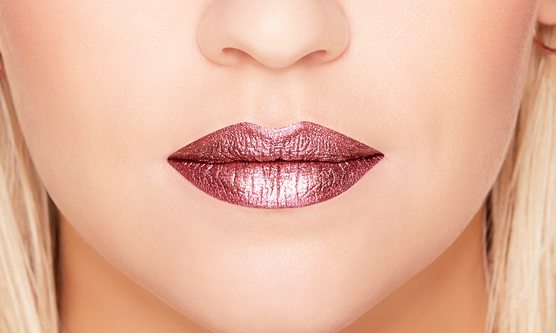 Dress it up: Use the metallic lip to complete your dressed up look. Take your favorite dark lipstick, apply it to your lips, then add some shimmery eyeshadow or pigment on top. This allows you to wear a color you’re confident in for a special occasion but make it a little more spectacular with metallic. 2. Keep the rest of your look neutral: If you’re worried about the metallic lip looking reminiscent of a robot-look rather than a fashion look, keep the rest of your look neutral. Keep the rest of your makeup neutral with subtle mascara and neutral blush and eyeshadow. 3. Go all out: If you’re more outgoing and like to be the center of attention, then really go all out when rocking that metallic lip. Apply it on your lips, eyelids, and even cheekbones. You’ll be sure to be the life of the party. Just remember there’s all kinds of metallic lip for every occasion: matte, glossy, layered; you just have to experiment and have fun. How do you like to style your metallic lip? Share below!